Download "FACT SHEET: HAZARDOUS MATERIALS ACCIDENTS"
2 If you hear a siren or other warning signal, turn on a radio or television for further emergency information. IF CAUGHT AT THE SCENE OF AN ACCIDENT If you see an accident, call or the local fire department to report the nature and location of the accident as soon as possible. Move away from the accident scene and help keep others away. Do not walk into or touch any of the spilled substance. Try not to inhale gases, fumes and smoke. If possible, cover mouth with a cloth while leaving the area. Stay away from accident victims until the hazardous material has been identified. Try to stay upstream, uphill and upwind of the accident. 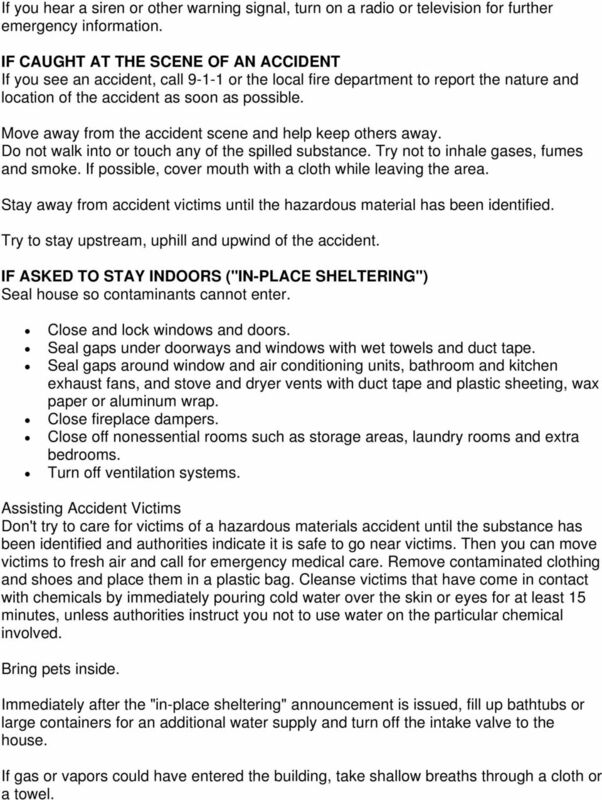 IF ASKED TO STAY INDOORS ("IN-PLACE SHELTERING") Seal house so contaminants cannot enter. Close and lock windows and doors. Seal gaps under doorways and windows with wet towels and duct tape. Seal gaps around window and air conditioning units, bathroom and kitchen exhaust fans, and stove and dryer vents with duct tape and plastic sheeting, wax paper or aluminum wrap. Close fireplace dampers. Close off nonessential rooms such as storage areas, laundry rooms and extra bedrooms. Turn off ventilation systems. Assisting Accident Victims Don't try to care for victims of a hazardous materials accident until the substance has been identified and authorities indicate it is safe to go near victims. Then you can move victims to fresh air and call for emergency medical care. Remove contaminated clothing and shoes and place them in a plastic bag. Cleanse victims that have come in contact with chemicals by immediately pouring cold water over the skin or eyes for at least 15 minutes, unless authorities instruct you not to use water on the particular chemical involved. Bring pets inside. Immediately after the "in-place sheltering" announcement is issued, fill up bathtubs or large containers for an additional water supply and turn off the intake valve to the house. If gas or vapors could have entered the building, take shallow breaths through a cloth or a towel. 3 Avoid eating or drinking any food or water that may be contaminated. Monitor the Emergency Alert System station for further updates and remain in shelter until authorities indicate it is safe to come out. Evacuation Authorities will decide if evacuation is necessary based primarily on the type and amount of chemical released and how long it is expected to affect an area. Other considerations are the length of time it should take to evacuate the area, weather conditions, and the time of day. IF ASKED TO EVACUATE Stay tuned to a radio or television for information on evacuation routes, temporary shelters, and procedures. Follow the routes recommended by the authorities--shortcuts may not be safe. Leave at once. If you have time, minimize contamination in the house by closing all windows, shutting all vents, and turning off attic fans. Take pre-assembled disaster supplies. Remember to help your neighbors who may require special assistance--infants, elderly people and people with disabilities. AFTER Return home only when authorities say it is safe. Follow local instructions concerning the safety of food and water. Clean up and dispose of residue carefully. 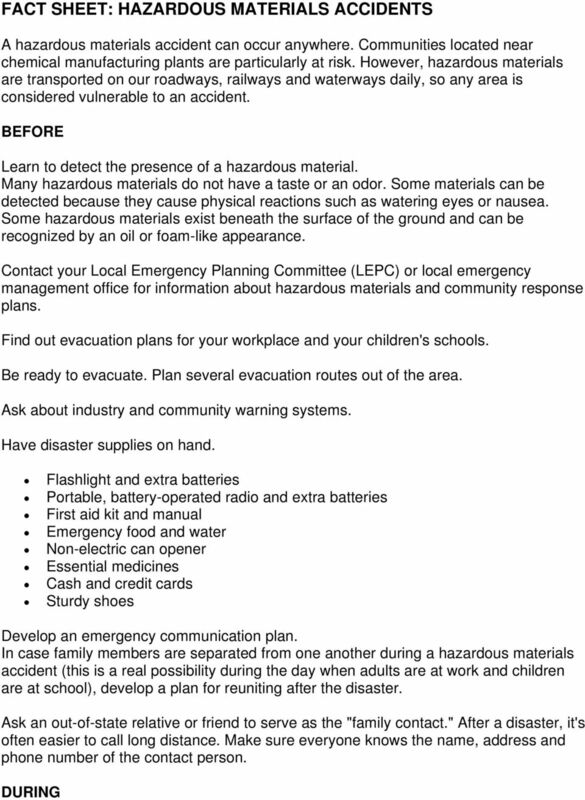 Follow instructions from emergency officials concerning clean-up methods. 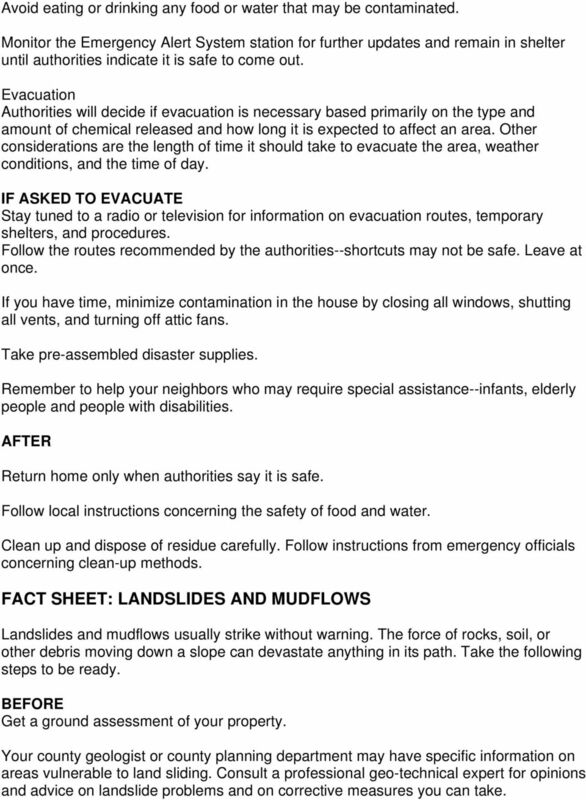 FACT SHEET: LANDSLIDES AND MUDFLOWS Landslides and mudflows usually strike without warning. The force of rocks, soil, or other debris moving down a slope can devastate anything in its path. Take the following steps to be ready. BEFORE Get a ground assessment of your property. Your county geologist or county planning department may have specific information on areas vulnerable to land sliding. Consult a professional geo-technical expert for opinions and advice on landslide problems and on corrective measures you can take. 4 Minimize home hazards. Plant ground cover on slopes and build retaining walls. In mudflow areas, build channels or deflection walls to direct the flow around buildings. Remember: If you build walls to divert debris flow and the flow lands on a neighbor's property, you may be liable for damages. Learn to recognize the landslide warning signs. Doors or windows stick or jam for the first time. New cracks appear in plaster, tile, brick, or foundations. Outside walls, walks, or stairs begin pulling away from the building. Slowly developing, widening cracks appear on the ground or on paved areas such as streets or driveways. Underground utility lines break. Bulging ground appears at the base of a slope. Water breaks through the ground surface in new locations. Fences, retaining walls, utility poles, or trees tilt or move. You hear a faint rumbling sound that increases in volume as the landslide nears. The ground slopes downward in one specific direction and may begin shifting in that direction under your feet. Make evacuation plans. Plan at least two evacuation routes since roads may become blocked or closed. Develop an emergency communication plan. 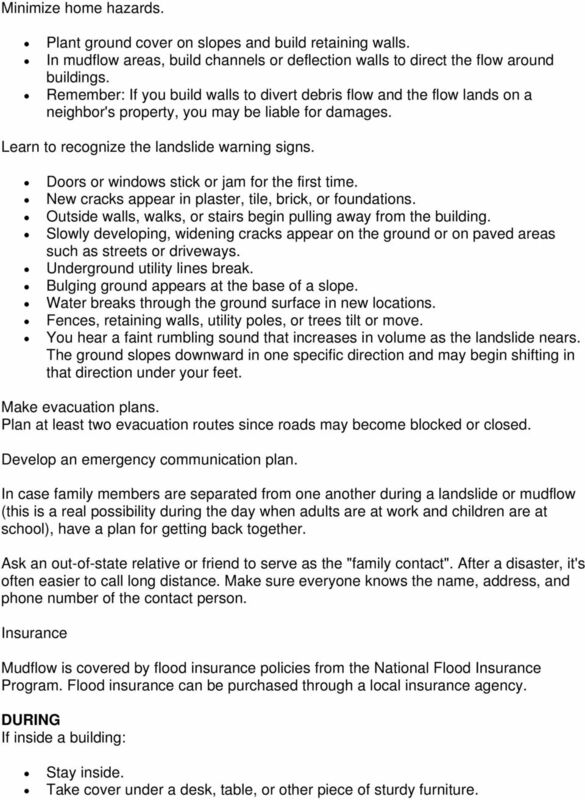 In case family members are separated from one another during a landslide or mudflow (this is a real possibility during the day when adults are at work and children are at school), have a plan for getting back together. Ask an out-of-state relative or friend to serve as the "family contact". After a disaster, it's often easier to call long distance. Make sure everyone knows the name, address, and phone number of the contact person. Insurance Mudflow is covered by flood insurance policies from the National Flood Insurance Program. Flood insurance can be purchased through a local insurance agency. DURING If inside a building: Stay inside. Take cover under a desk, table, or other piece of sturdy furniture. 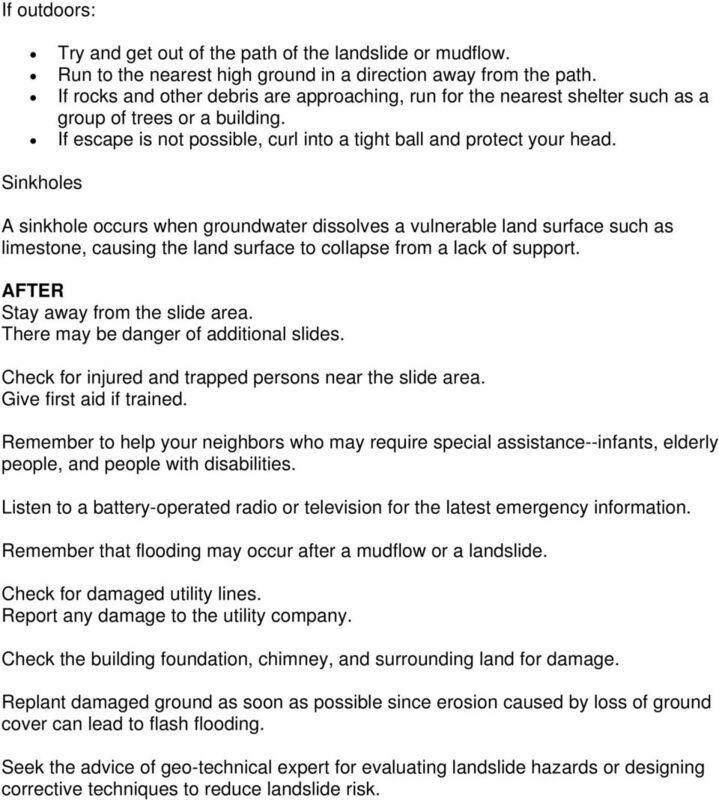 5 If outdoors: Try and get out of the path of the landslide or mudflow. Run to the nearest high ground in a direction away from the path. If rocks and other debris are approaching, run for the nearest shelter such as a group of trees or a building. If escape is not possible, curl into a tight ball and protect your head. Sinkholes A sinkhole occurs when groundwater dissolves a vulnerable land surface such as limestone, causing the land surface to collapse from a lack of support. AFTER Stay away from the slide area. There may be danger of additional slides. Check for injured and trapped persons near the slide area. Give first aid if trained. Remember to help your neighbors who may require special assistance--infants, elderly people, and people with disabilities. Listen to a battery-operated radio or television for the latest emergency information. Remember that flooding may occur after a mudflow or a landslide. Check for damaged utility lines. Report any damage to the utility company. Check the building foundation, chimney, and surrounding land for damage. Replant damaged ground as soon as possible since erosion caused by loss of ground cover can lead to flash flooding. Seek the advice of geo-technical expert for evaluating landslide hazards or designing corrective techniques to reduce landslide risk. There to help when you need us most. With a combination of soaking rain, flying debris, high winds, and tidal surges, Hurricanes and tropical storms can pack a powerful punch.